Printed edition now shipping. Digital edition delivery February 26. Subscribe to Celebrations in Quilting and never miss a 2018/2019 issue. Subscription is Winter 2018, Spring 2019, Summer 2019 and Fall 2019 issues. You may choose digital or printed delivery from the drop down box below and take advantage of significant savings over single issue pricing. Digital Subscriptions: No shipping fees charged. Price includes 4 issues delivered quarterly to the email address your provide (Dates are staggered, seasonally. Issues release 2-1/2 to 4 months apart). Files arrive in "zipped" format. File sizes are large and download times will vary depending on your internet speed and provider. 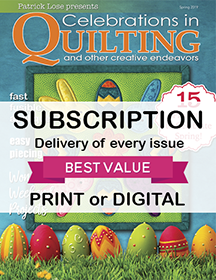 Printed Subscriptions: By subscribing to Celebrations in Quilting, enjoy a reduced cover price AND save on shipping rates. Magazines are delivered quarterly by US 1st Class Mail. Print subscriptions are only available in the US. Celebrations in Quilting is available in your local Quilt Shop. If they do not carry it, ask them to!